Weight machines safely isolate specific muscle groups. Weight machines are ideal for beginners or those recovering from an injury as they guide exercisers through the movement. This results in properly executed exercises, which can reduce the possibility of accidental injury. Although weight machines have their disadvantages, they can effectively fatigue muscle groups. 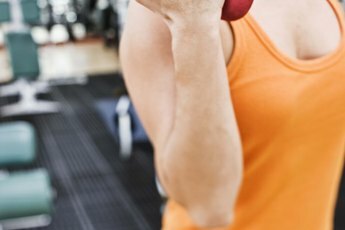 Women may challenge their muscles while enhancing their endurance by engaging in circuit training routines. Warm up your body by doing 10 minutes of light cardiovascular exercise such as using a treadmill, stationary bicycle or elliptical machine. Start the circuit training routine. This weight-machine routine isolates major muscle groups within your body. Aim to complete nine to 12 weight stations within one circuit. However, for the sake of clarity, this guide outlines 10 weight stations. Perform eight to 20 repetitions within each exercise station. Do not use excessively heavy weight. Rather, lift a weight amount that is 40 to 60 percent of your 1RM, or one repetition maximum. 1RM refers to the amount of weight you can successfully lift within only one repetition. Begin the circuit training routine with the shoulder press exercise using the shoulder press machine. Rest for a maximum of 30 seconds after completing the recommended number of repetitions, and then immediately move onto the next exercise. Engage the chest muscles with the bench press machine. Perform the recommended number of repetitions. Rest, and then move onto the seated leg press machine, which works the quadriceps. Next, isolate the back muscles with the seated row machine. Continue by targeting the hamstrings with the seated leg curl machine. Return to working out the upper body by using the front pulldown machine. Next, target the biceps brachii muscle group with the bicep curl machine. Follow this exercise with the overhead triceps extension, then moving onto the seated calf extension exercise. Finally, target the abdominals with the seated crunch machine. Repeat the above circuit of 10 exercises up to five times. However, aim to complete at least two to three circuits. Cool down your body by performing five to 10 minutes of light cardiovascular activity. Add 30 seconds to three minutes of aerobic activity between circuit stations to enhance cardiorespiratory endurance. 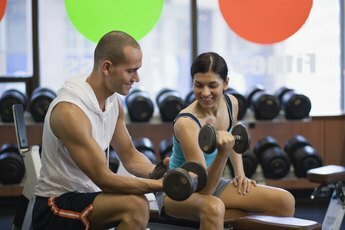 Do not use weight that is so challenging it’s difficult to complete the recommended number of repetitions per exercise.